It has been a ridiculously long time since there have been any updates on this blog! I had a backlog of content but last quarter I was swimming in coursework and had little energy. I plan on posting every Tuesday and any extra posts will be published throughout the week. I've been experimenting with my lighting setup in addition to candid shots. Today I have for you my dear friend Kyra (IG @vivienneaulaire) as my delightful hand model! She's always fun to have around and whenever she comes over to be an enabler of my nail art shenanigans, we use it as an excuse to make the house smell like a chemical implosion as we binge-watch Netflix. Not to mention all the baked goods and other creative mischief we get ourselves into. She's a glorious enabler! We made and ate so many cookies! But now to the nail art (a close-up further in the post)! 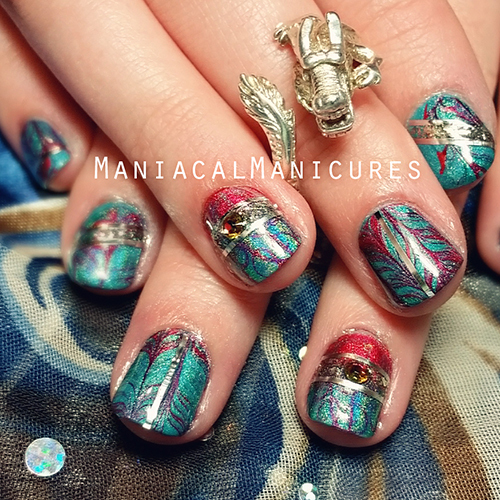 I used the dry-marble technique on my UberChic Beauty Mat using the Pure Color #7 Watermarble Tool from WhatsUpNails. At the moment I have been using Zoya "Naked Base" and "Pink Perfector" as my basecoats as they have been doing wonders at strengthening the nails and I've noticed a significant reduction in chipping since I started using them exclusively for the last few months. 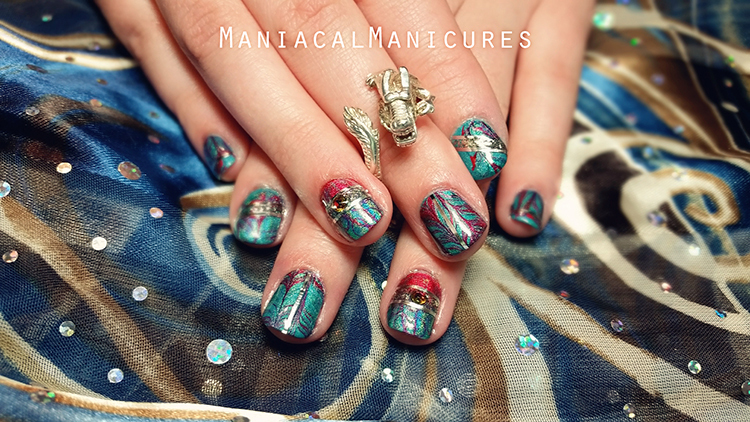 For the dry marble, I used Emily de Molly "Reflection," "Land of Confusion," and SuperChic Lacquer "Realm of Erotica." All are holographic and oh so gorgeous! Did I mention I love coordinated colors that dramatically pop? How about my general love of all thinks turquoise/aqua and red/coral? For the nails with the red/turquoise split, I used the Creative Shop Original Stamper to create a gradient stamp using the same polishes for the dry marble, and then used the opposing colors to create contrast between the background polish and the stamped polish. I stamped using a Valentine themed stamping plate from Messy Mansion (I forget which one but I'll update when I find it). For the accents I applied silver nail ribbon tape from Sally Beauty Supply and cut it using KBShimmer Cuticle Trimmer. I then filled the spaces between with Polish Me Silly "Hypnotic." "Hypnotic" is amazing not just because it is a gorgeous silver flakie, but because it is made with authentic sterling silver flakes and it flashes like nothing else I've ever seen in both mainstream and indie-brand markets. I applied Swarovski "Hot Fix" Crystals that I got from Jo-Ann's Craft Store (I applied them with topcoat, and did not use a heat source). I topped it all off with the most glorious, fast-drying topcoat of all time, SuperChic Lacquer "Marvel Topcoat." Okay, let's get the closeup of her gorgeous fingers! Because we want to look closer! Gah! I'm in love! I had so much fun doing this manicure! Pure Color #7 Watermarble Tool can be found at WhatsUpNails here. Messy Mansion stamping plates can be found on Facebook, Twitter, Instagram, Pinterest, and their Website and stockists. I purchased mine from Beautometry. Emily de Molly can be found on Facebook, Twitter, Instagram, Pinterest, and their Website (US) & Website (AU) and stockists. Polish Me Silly can be found on Facebook, Instagram, Pinterest, and Etsy.